Almost done with space cat and friends. I did miss a few tropes, such as alien rain forest, swords in space, robots, and I am sure there are others I did not list. But I did get token girl, multi-limbed alien, bubble helmet and jet pack, and primitive side kick. Not to mention primitive fauna as alien, two moons, and spiky mountains. So it was not a complete failure. 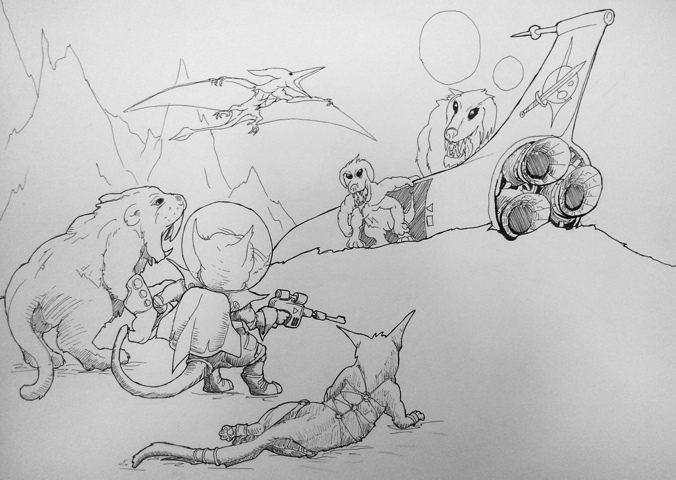 This entry was posted in Quick Desksketch and tagged cat, space, space cat by Anthony. Bookmark the permalink.